Open to vehicles from May 1 – October 31. Van Sickle Bi-State Park represents a long held vision and partnership between the states of California and Nevada and a regionally significant recreational opportunity at Lake Tahoe. When the Van Sickle family donated 542 acres to the Nevada Division of State Parks (NDSP) in 1989 to create a new park, the Nevada Division of State Parks (NDSP) and the California Department of Parks and Recreation envisioned acquisition of the adjacent 156 acres on the California side to develop the nation’s first bi-state park. In 2001, the Conservancy purchased the California property to bring this concept to fruition. 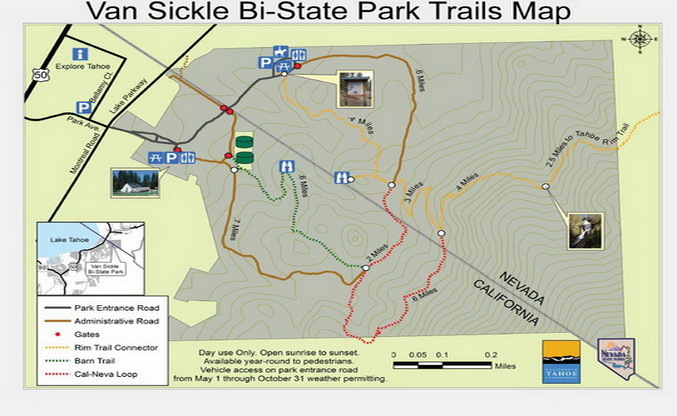 Van Sickle Bi-State Park is located within a few minutes’ walk from the Stateline casino core. The park is adjacent to the largest bed base in the Lake Tahoe Basin, and will connect with the Conservancy’s proposed South Tahoe Greenway, the Tahoe Rim Trail’s Van Sickle Connector and Daggett Trail System, and the nearby, Conservancy-funded Explore Tahoe Urban Trailhead. The site is unique in its location within the Basin’s largest urban area. Within a few minutes’ walk from the casino core, it is possible to enjoy a high-quality natural experience. This strategic location immediately transitions from the dense urban context to a natural setting and provides opportunities for short day use outings, longer hikes, extraordinary views of Lake Tahoe, and enjoyment of an historic barn which showcases the region’s cultural heritage. Through a Memorandum of Understanding, NDSP and the Conservancy partnered to design and develop the new park. A resource inventory and vision planning process included such amenities as day use areas, an equestrian trailhead and historical/cultural interpretation of the park’s historic equestrian complex. Phase I park construction includes an access drive, utilities infrastructure, drainage improvements, SEZ restoration, Nevada trailhead, California day use area and multi-use trail. Phase I construction was completed in Fall 2010 and Van Sickle Bi-State park opened to the public in Summer 2011.